Yukirin’s 1st National Solo Tour started in Niigata on April 14. Her first concert took place at the Niigata Kenmin Kaikan Hall in front of ~1,800 fans. Yukirin said because she’s a NGT48 kennin member so she wanted to start the tour in Niigata. The entire NGT48 group went to her concert including Imamura shihainin! Yukirin wowed the crowd by singing 24 songs with an amazing setlist. She even surprised fans by playing electric guitar for one song. The concert outfits were by Shinobu’s company, Osare Company. Her group also did Yukirin’s 3rd Solo Concert. Shinobu Team’s designs match Yukirin very well which is no surprise as Shinobu has known Yukirin for 9 years. I said if any NGT members want to come then come. It ended up being every member. “The month after will be sousenkyo again. It’s something that will happen regardless! I think of everyone who is here as a supporter. As an AKB member and doing solo work, wouldn’t it be amazing to do well at sousenkyo? Let’s use this moment as an election rally (Audience: ooohh!). Although it’s my 9th year already, but I am just as serious this time. Concert goods featured towel, tshirts, Yukirin Daruma penlight and charms. The new Yukirin Daruma penlight has a wider body compared to Version 1.0 (new version has white handle). As a Watanabe Entertainment premium member, you can also get a special venue limited Member’s card. For the Daruma Charm, there are 13 (12 plus a bonus version) all together. If you’re lucky, you’ll even get a slip with the charm to win a hand signed card from Yukirin! 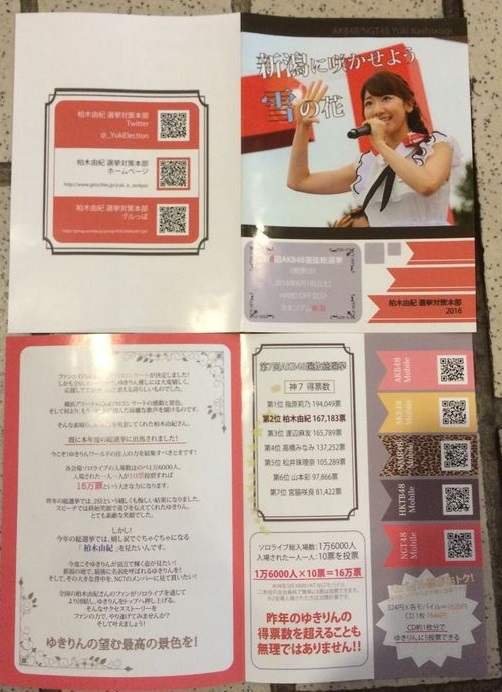 Yukirin’s election committee also handed out flyers to the audience! has come true because of everyone!! 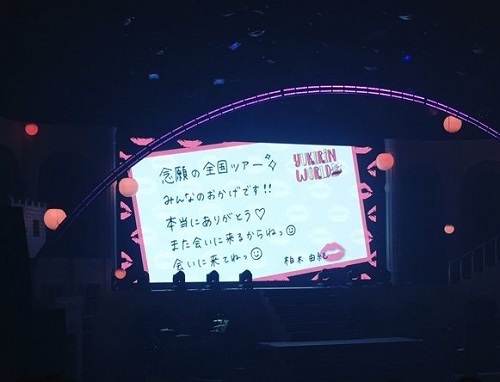 Yukirin gave out treats to every staff and wrote a personalize message to each person!